The main sound urban planning tool is the sound intensity level (dB), Which is not useful enough to show the time and frequency variation of sound. It is necessary to propose new and simple tools to help professionals. In this paper it evaluates the use of the spectrogram to characterize urban soundscapes predominantly commercial use. 16 urban environments have been evaluated in Barcelona, analyzing their spectrograms in relation to its commercial urban morphology and intensity. The spectrogram has been useful to understand how different urban configurations modulate the soundscape through the main noise source in the city, the vehicle traffic. Moreno, J.; Zamora, J. El espectrograma como base para la agrupación de paisajes sonoros urbanos. A: Congreso Español de Acústica. 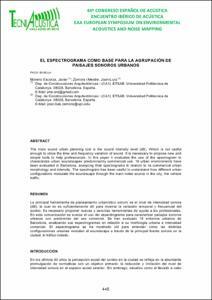 "Publicación Oficial del 44º Congreso Español de Acústica". Valladolid: Sociedad Española de Acústica, 2013, p. 446-453.